Project Objective: Take an aging Cruiser and give it suspension, brakes and the power to need them! 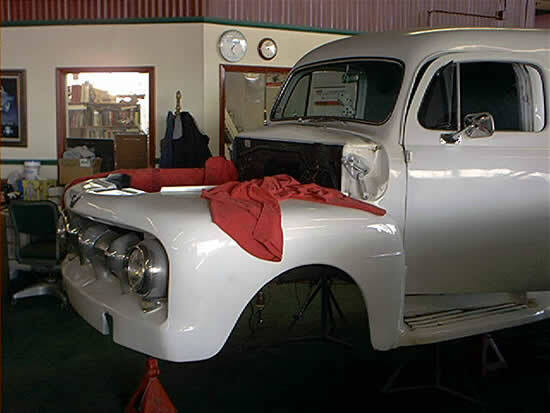 Project Summary: Running a straight axle and drum brakes will not cut it if you plan on hauling the family behind a 500 Horse, Weber Carbed, Bored and Stroked 427CI Windsor! Phase one calls for a Custom Boxed Chassis, Tremec 5-Speed, Heidt's Suspension front and back, 4 wheel disc brakes, Fuel Cell, Moon Guages, Seating for 5, an Alpine Stereo/CD player, Multiple Screen DVD player and a steel tilt front clip! Very Cool, Indeed!! The old chassis has been pulled at this point.